Now THAT is a Deed of Arms…. n an earlier post, we told you about the recent armoured deed of arms held at the recent Western Martial Arts Workshop. We’re happy to say that our good friend Roland Warzecha of Hammaborg turned his photographer’s eye to the Deed, and put together this collection of photos that he has graciously allowed us to share with you. 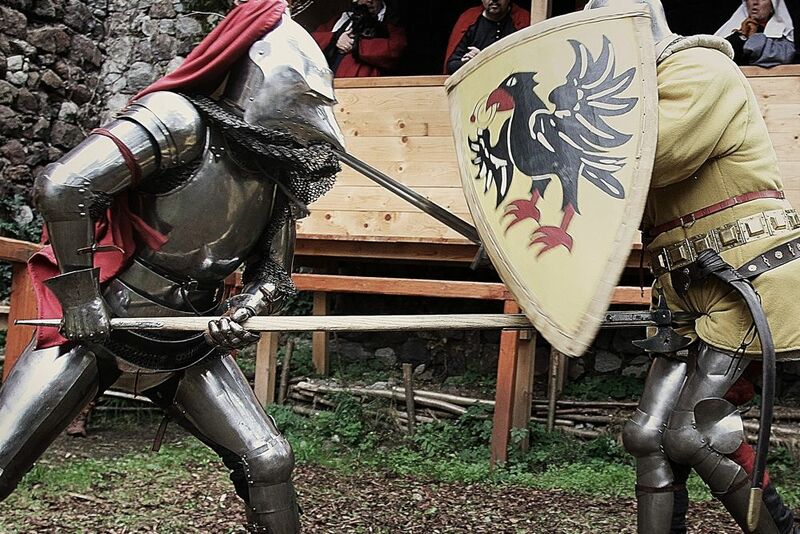 Now while we are still in the deed of arms afterglow, we thought we’d share a little “arms and armour envy” of our own: the Laurin Tournament. 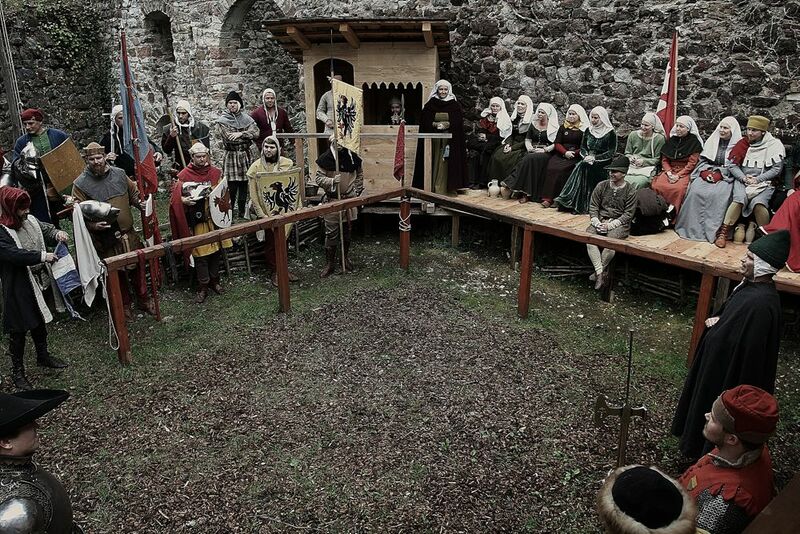 Held in early October at Castle Mayenburg in Völlan, South-Tyrol, Italy the tournament is in its third year. Run by the “Gesellschaft des Elefanten” (Company of the Elephant), a living history group recreating the last decade of the 14th century. The Laurin Tournament is described as a series of single foot combats meant to simulate a deed of arms from the period 1370 – 1400. The full rules for fighting in the lists can be found at the Laurin Tournament website, but what you’ll really want to browse is the substantial and amazing gallery they have provided from past years. As we found with the WMAW Deed of Arms, setting the right tone is important. For a martial arts event, that is balancing history and tradition with modernity, while still conveying the right “mood” and homage to the antiquity of the martial art being displayed. In a living history style of event, the look and feel of the period is paramount. 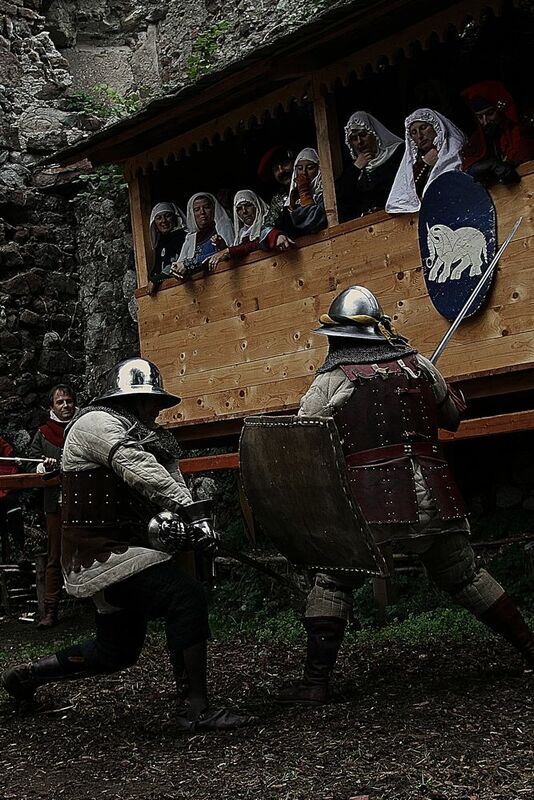 For North Americans interested in medieval living history, we can only help but be envious at the advantage Europeans have in being able to hold their events in real castles, old towns or ancient ruins. But even then, there is having a nice locale for your event, vs. really setting a scene! We can see why the organizers of this tournament are so proud of their location. The 6 m x 6 m list, raised platform and enclosed gallery truly sets a scene right out of a medieval illumination, which must make it hard for the combatants not to be duly inspired a they don their helmets! According to the published rules, each of the combatants will fight between five and eight times, so the total fight time is from a minimum of 40 minutes to a maximum of 64 minutes. We’re not sure how much time the combatants had between bouts, but 64 minutes of actual combat time in full harness can be a pretty darn good work out! Now we admit to having a weakspot for late 14th century armour, and certainly, the Company’s choice of the Elephant for a badge and location in the Tyrol can’t help but make any student of armizare‘s heart beat more quickly, but what we are most interested in is tipping our hats and celebrating the efforts of kindred spirits who seeks to set a higher bar for celebrating both our history and the martial arts they produced. s the pen mightier than the sword? New at this year’s Workshop was an armoured Deed of Arms, in which seven challengers agreed to meet and hold the field against all challengers (suitably armed and armoured), with sword, axe, spear or dagger. In the pas d’armes, combatants challenge one another for the pleasure of the combat-not for victory. In reality, other than the winner himself, few remember who one any given tournament, but all remember an exciting, invigorating – or embarrassing – bout, and the names attached to that bout. Renown is earned within the lists by demonstrating great skill (prowess) combined with the other chivalric virtues of, courage, generosity, humility (in accepting defeat or victory), faith (in our ideals), a sense of justice and the duty of defense. These are the real contests of the tournament, and it is the yardstick by which we are measured. The ‘gallery’ and your opponent can see who you are; it is hard to be deceptive of your motives and your sincerity in such contests. Greg, Christian and Adam all donned their harness and broke a few lances with the other combatants. Christian, who had been chosen as the captain of the challengers, began the Deed by meeting the defender’s captain, none other than FAP author Robert Charrette! They engaged in a long, vigorous fight with poleaxes, that set the tone for the rest of the Deed. It fell to Christian to also fight the final bout of the day, a duel with spears fought with Greg! We have been asked if there were any particulars wagered on the encounter, such as majority share in the press. Well, maybe so and maybe no, but fortunately the encounter was a draw! The armoured Deed of Arms was a great deal of fun, and the only regret was having it come to an end! But the special events continued. 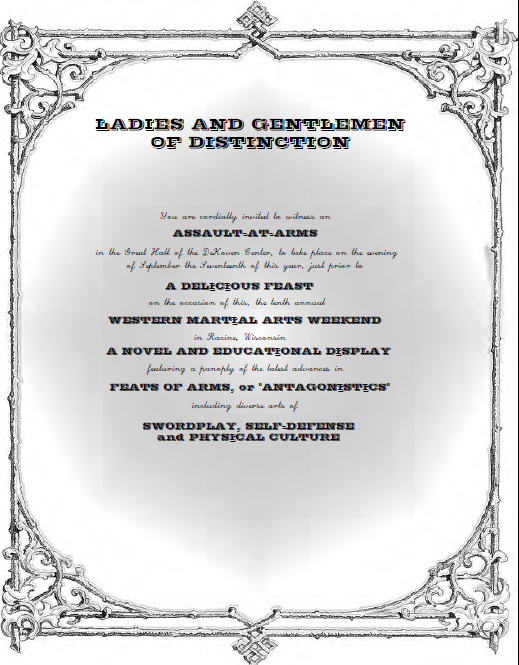 This year, there was something new: a proper, late Victorian Assault-at-Arms, organized by Bartitsu and Victorian “antagonistic” expert, Tony Wolf. The tradition of the Assault-at-Arms became well-established throughout the British Commonwealth and the United States during the latter part of the 19th century. Thought to have been originated by British troops serving in India, Assaults-at-Arms developed into popular events whereby soldiers, gymnasts and combat athletes demonstrated their skills for an appreciative public, often in aid of charitable causes. 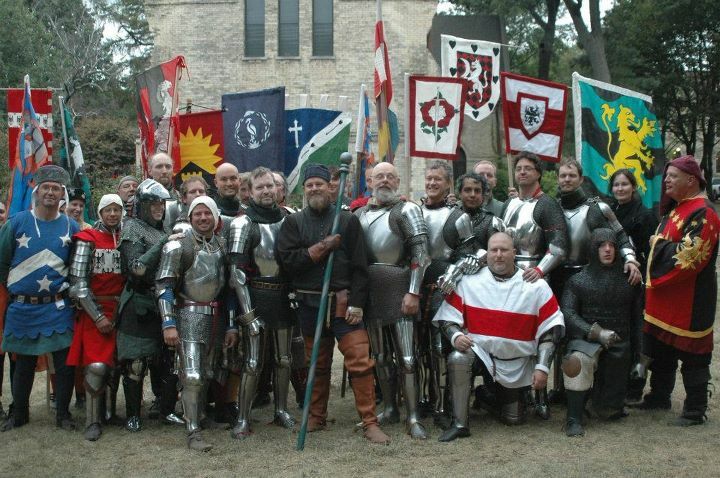 The 2011 WMAW Assault-at-Arms notionally took place in September of 1901 and featured displays of various forms of military and civilian swordsmanship, French cane and baton fighting, and incorporating the “Elizabethan swordplay” that was then being revived by a coterie of fencing antiquarians led by Captain Alfred Hutton. There was also exhibition of self-defense via E. W. Barton-Wright’s Bartitsuby Tony Wolf and his co-host, the mysterious “Professor X”. Greg had a chance to be a part of the Grand Assault at Arms in an exhibition of two-handed swordplay, ably assisted by Ms. Nicole Allen. Although the material demonstrated was taken from modern reconstruction of Italian and Iberian sources, rather than Hutton’s set-plays, the demo was in the style and flavor of Victorian demonstrations of “Ancient Swordplay”. You can also learn more about the Grand Assault in this essay by Tony Wolf, and even more in his forthcoming Ancient Swordplay. Of course, we aren’t just swordsmen….we are merchants. 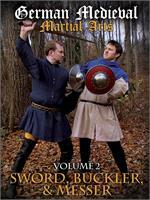 So with all of those martial artists gathered at WMAW, we thought it the perfect time to debut not one, but two new titles that we guarantee are game-changers for students of medieval martial arts: Armizare: The Chivalric Martial Arts System of Il Fior di Battaglia and the new Agilitas DVD, Sword and Shield.